Special notes: I worked in continuous rounds with a 3.75mm hook and worsted weight yarn. The head, neck and body are worked as one piece. Have any questions or if you come across a mistake in the pattern please leave a message in the comment section below. By crocheting in the front loops for the last 2 rows you created a couple edges on the inside as pictured below. This is where you insert the color you will use for the shorts (black). Use the edge that is furthest from you when you look inside. **The line inside you are about to crochet into does not appear even but it will even out when you crochet the one loop to the next. (enlarge the picture above by clicking on it to see what I mean). 2+) In the BLO, 2tog until you close the gap. 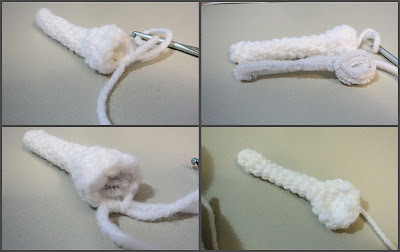 Bend a pipe cleaner so 2 halves are same length as leg and wrap the remaining pipe around finger as pictured below. Insert into leg and shape foot as desired. Fiddle around with it until you are happy with the shape and also the leg should stand up on it's own. Cut a piece of white felt and hot glue it to bottom of foot. *Optional, if you want bendable arms the insert pipe cleaner as pictured. If not then continue on with row 14+ and DO NOT stuff. 14+)1sc the 2tog until you close the gap. Finish off and leave long tail for sewing and shaping hand. 1) Magic circle 4. Do not join. 2) 1sc then 2sc in the next 2st then 1sc in last st. Finish off. Leave long tail for sewing. 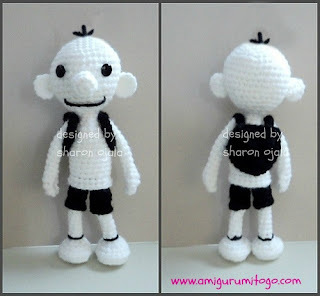 So now we're finished and you have your own Diary of a Wimpy Kid Inspired doll! I'm currently making this sitting in my floor by my bed using a magnifying mirror for light, Its almost 2 am. I have a 5 month old who doesn't sleep through the night, and two boys I have to get up and ready for the bus at 6:30, so I SHOULD be sleeping. But I can't put this doll down, I love it so much. Thank you so much for the pattern my boys love the books/movie. I can't find part 2 or 3 on YouTube..HELP !! Made this for my son. One leg turned out longer than the other, but he loves it. Thanks so much for the pattern and the video tutorial. So sorry for the late response! So glad you planned to make the dolls, now I wonder if you did and how everything turned out? I am in LOVE with everything you post. I wish to thank you from the bottom of my heart. I will be making as many of all of these that I can. OH, the Leather boot is awesome. I will make a few because I will want to keep one and I know my kids and grandkids will want their own. You are amazing. We are already friends on Facebook! I saw your boot turned into a dollhouse and remembered commenting that I couldn't wait to see it. isn't that funny? I just left a comment on your other page apologizing for never sending you the picture I crocheted of greg from diary of a wimpy kid. Except much more traffic and interest in your doll because of the upcoming movie! I'll go check my other page to see your comment. I'm glad you like the boot dollhouse, I will be starting the new one when I get home from holidays, can't wait!! I actually found some furniture for it here in Calgary, Alberta in a thrift store.. Your patterns are just gorgeous and a huge Thank You for sharing them. My 7yr old grandson just started reading the Diary of a Wimpy Kid books so I am thrilled to have found these patterns to make him the characters. They are adorable and your patterns are so easy to follow. I just started 1 a couple of hours ago and just about done. Thank you again so very much. What sized eye do you use for Greg and Roderick? What row are they on? I have been asked to make these for a library program and I want them to look right. Great pattern! Thank you so much. I've been dying to make Coraline too. 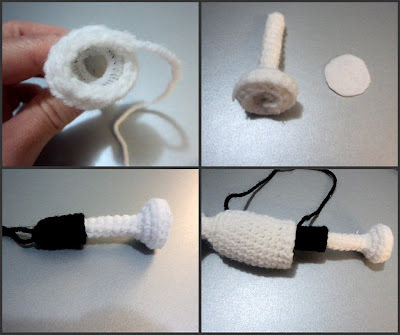 I clicked on the link "How To Crochet A Greg Doll" and it takes me to "How To Crochet A Cat Bus"... Am I missing something?? that was strange! Greg's video has been up for over a year and I just uploaded the Cat Bus video last week.... I'll have to go check the other patterns but this one is now fixed. Thanks for letting me know! Seriously! I am having 3 other dolls made for my girls and I could not think of anything to have made for my son. I could NOT believe my eyes when I saw this! My son LOVES the books so much. He is going to be thrilled! Thank you sooo very much! Thanks again for taking the time to comment, I appreciate it! Greg is awesome! My grandson loves the books. His birthday is in a couple of weeks and I'm going to make him one. I do have a question. What size eyes did you use and how did you make the hair? I couln't find the instructions in the pattern. You do incredibly beautiful work and thank you so much for sharing. Thank you Lynn! I wrote this pattern back when I was first starting out so I did miss a few details. The hair started out as a pipe cleaner and then I changed it to black yarn. Pull a strand through a stitch on the head and knot it off and cut to length. The 2nd piece do the same way but once you knot it off pull one of those ends back into the head to hide it so Greg should have 3 strands standing up. You can rub clear drying glue on the ends to keep them from fraying. The eyes are actually buttons I found at a fabric store. My best guess for size would be 8mm but can't say for certain. I hope to go over this pattern sometime this year and clear up those issues but for now I hope that helps! Happy Crocheting and all the best to you and yours! do you have the instructions for the face and hair? i don't see them on the pattern... thanks! Sorry about that. I have this pattern on my list to revise. I wrote it back when I was just starting so I missed those details in the written pattern but it is shown on the video I'll link here. Just fast forward to the time 10:22. Hope that helps! I'm wanting to print this off but am not able to see a print button. Whenever I try to highlight and copy I get the message to use the print button on the bottom of the pattern. ?? I want to thank you for this and all the other patterns you share with us. My grandson loves these books/movies and he will be most assuredly very pleased to get this Greg doll. All the best to you and your grandson! ¡Hola! Escribo desde Murcia, España, y quiero darte las gracias por poner gratuitamente el patrón de Greg. Además en los vídeos que acompañan el tutorial está todo muy bien explicado. Mi hijo es fan de los libros de Greg y le ha hecho mucha ilusión que le tejiese el amigurumi.¡ Muchas gracias y saludos! Dear Sharon - your pattern is brilliant and perfect. I have made Greg for my grand-daughter for Christmas. I even made two little Wimpy Kid diaries to put in the backpack. Can't wait to give it to her. Thank you for sharing your creativity.